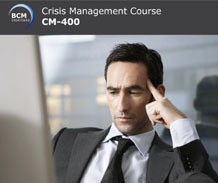 Business continuity professionals can look forward to improving their crisis management competency in this 4.5 days CM-5000 Crisis Management Expert Implementer course. 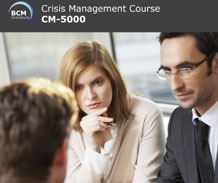 The course allows participants to get understand the fundamentals of developing a CM strategies. Participants will also be equipped with the skills to design and implement a CM plan as well as how to prepare and conduct an awareness and training programme would also be shared. Crisis Management Certified Expert (CMCE) Certification is awarded to participants who successfully completed their CMCE examination and have at least 3 years of relevant crisis management experience. A non refundable application processing fees of SGD150 is needed to start the CMCE application process. Identify possible threats that may disrupt the organisation. Strengthen the organisational resiliency to counter major incidents and disaster. Develop and implement comprehensive CM plans. Create and develop CM awareness and training programme. Implement CM audit and assessment programmes to ensure CM plan effectiveness. Ensure effective program management on an ongoing basis. Crisis Management, Emergency Management or Incident Management team members. CM/ BC Managers, Organization BCM Coordinators and Practitioners tasked to drive large and complex corporate level CM programmes. Type: 150-Multiple Choice Question invigilated online exam. Duration: maximum of 3 and 1/2 hour. *This course fee does not include application processing fee for the CMCE certification. Learn more about CM terminology and phrases via our BCM Glossary or BCMpedia. Learn how to prepare for this course, via BCM Body of Knowledge. HRDF Funding Claimable. To know more about how much you can claim, please refer to your HR Department. Course could only be conducted if the minimum number of participants is met. BCM Institute reserves the right to alter the course content, alter the course location, cancel or reschedule the course at any time without liability. Affected participants will be able to defer their course registration.